Are you planning to run contests and giveaways to grab your customers’ attention this holiday season? Wondering how you can stay in touch next year with all the new fans and followers you gain from your Thanksgiving, Black Friday and Christmas promotions? We have the marketing automation tools that will help! 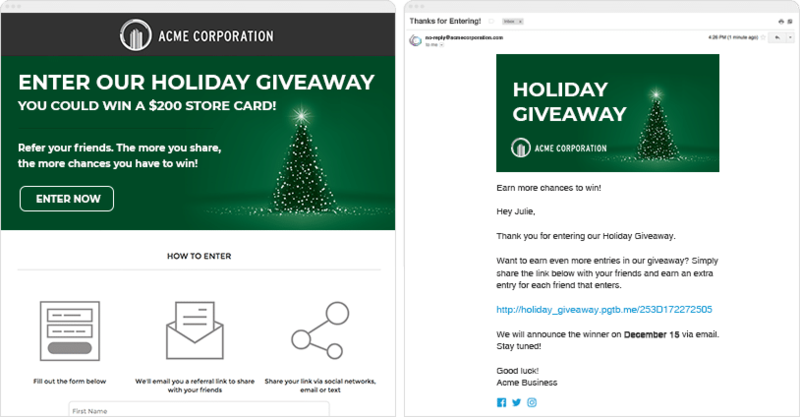 The engagement you see when you run a holiday contest or giveaway is gratifying…but the connections you make are also very valuable — especially if you’ve managed to collect your contest entrants’ email addresses. 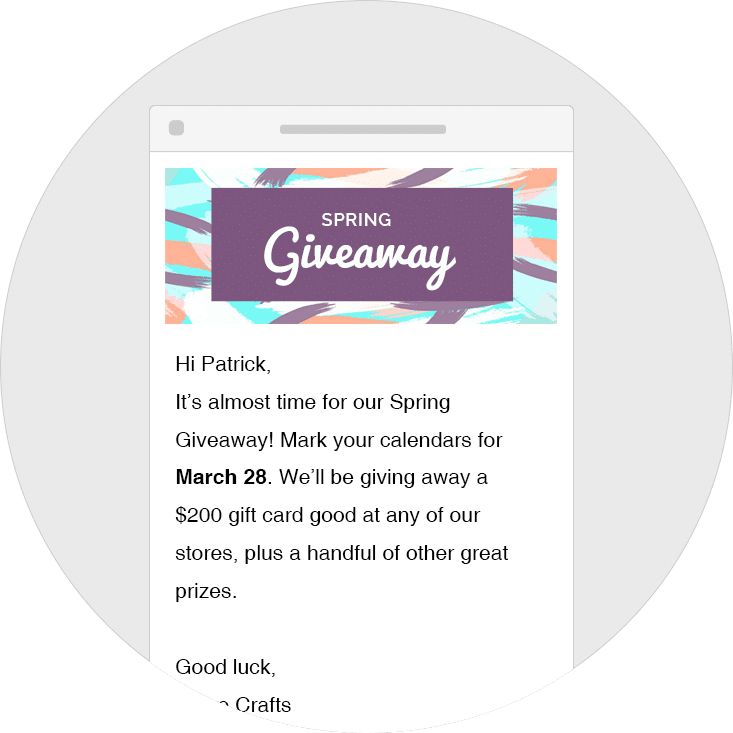 We’ve seen ShortStack users host giveaways that add thousands of people to their email lists in just a few short weeks. Email addresses are the most valuable resource to come out of a contest or giveaway, and the best way to stay in touch with people so you can turn them into paying customers. 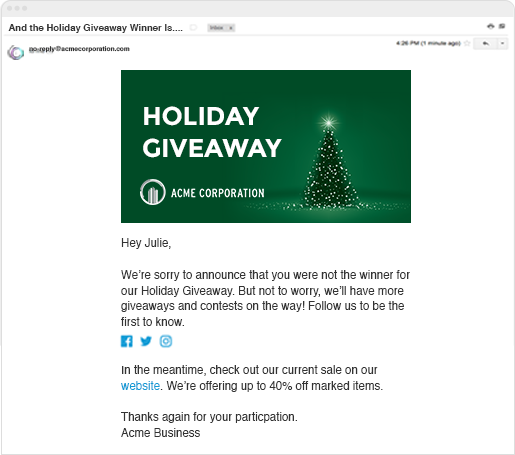 In this post, we’ll look at holiday email marketing ideas, including a series of autoresponders and scheduled emails to send out during the hours, days and weeks after people have entered your holiday contest or giveaway. And we’ll also suggest other ideas for how to follow up with them in January and February, and beyond. The goal? Keep the momentum from your Thanksgiving, Black Friday and Christmas holiday contests and promotions going strong. Here are 10 holiday email marketing ideas and automated emails to help your brand stay top-of-mind with all your new customers. Send a “Thank you for entering” autoresponder immediately after a user submits an entry. This doubles as a “Welcome” email. 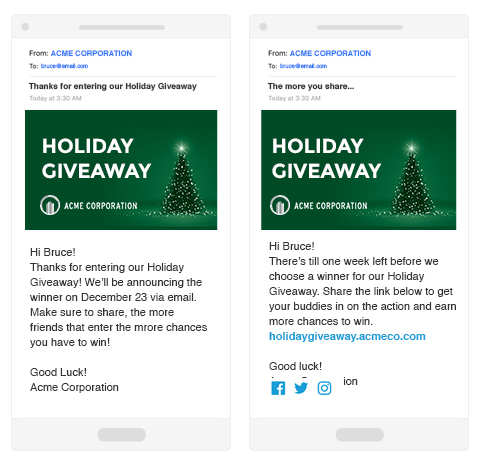 Your holiday contest may have reached people who have only recently learned about your business because of your contest, and the tone you set with this email will determine whether or not they continue to follow you after the contest is over. Contest details, including how a winner will be chosen, when the winner will be announced, and whether people can enter multiple times. Social sharing/follow buttons making it easy for people to follow you. If you’ve enabled a “refer a friend” feature that awards bonus entries to people who share your contest, remind them in this email. Remember, the welcome email is designed to establish a relationship between you and the lead—that’s it. 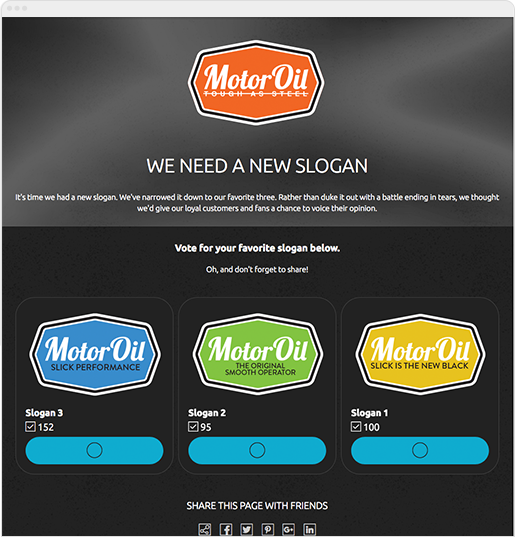 The goal of this email is not necessarily to sell your products or services just yet. 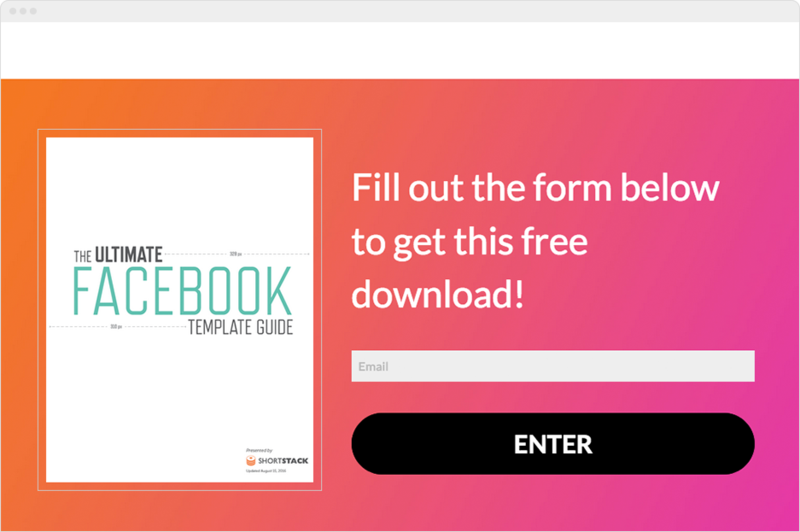 ShortStack users who send “Thanks for entering” emails see an open rate of more than 50 percent, so this first automatic email message is certainly an opportunity to increase awareness of your business beyond your contest. ShortStack’s most popular holiday template is our Multi-day Giveaway Calendar. 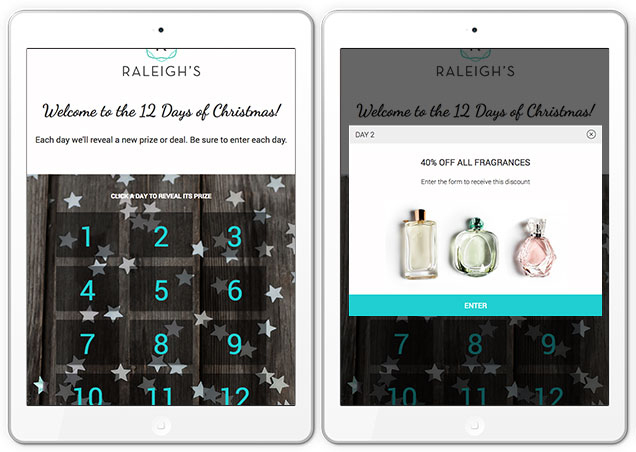 Businesses love it because it makes it easy for them to give away more than one prize — the template is modeled after an advent calendar — and it’s designed to encourage repeat visits. 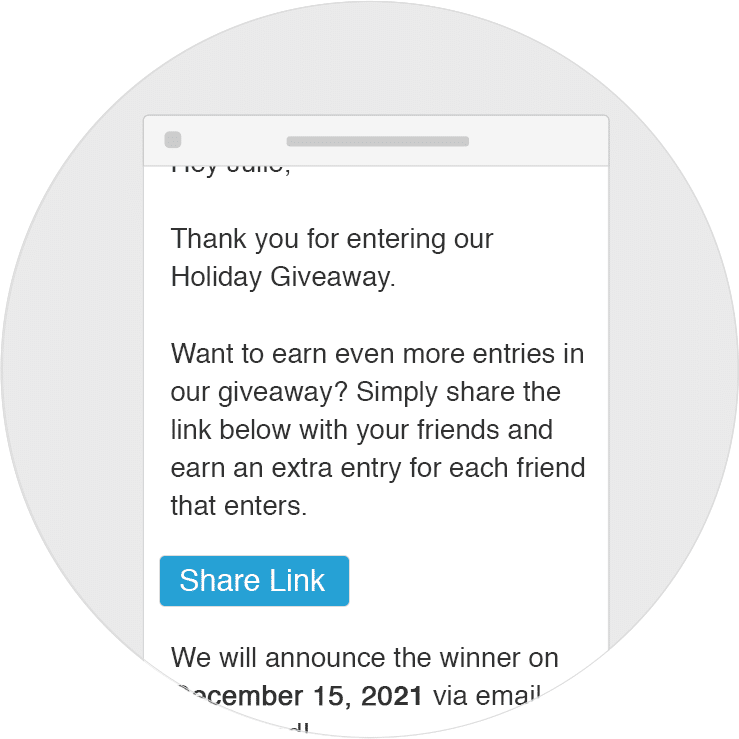 If you’re running a multi-stage holiday contest like this one, you could send several automated email messages during the duration of your giveaway to remind people who’ve already entered that they can enter again, or get more chances to win your prize if they share the contest with their friends. Remind users what the prize is and why it’s valuable. Remind users how they can earn more entries or continue to participate in the contest. Include a CTA to share the contest with your friends and/or to follow your social media profiles. Remind entrants of relevant dates — such as when the giveaway ends and how winners will be notified. These emails should convey a sense of urgency in order to motivate immediate action. Phrases like “4 days left until we choose a winner!” and “Don’t miss one more chance to win our grand prize” can go a long way to getting the re-engagement you’re looking for. At the end of the contest or giveaway, use an autoresponder to announce your winner(s). It’s a best practice to email everyone who entered your holiday contest or giveaway to announce a winner. Since everyone who entered your contest will be curious to know who won, this kind of email also has a fantastic open rate. It’s a best practice to email everyone who entered your holiday contest or giveaway to announce a winner. Include a CTA to follow you on your favorite social platforms so entrants will get the announcement about your next contest first. Let people know about any upcoming events or special offers. Thank them once again for their participation. Have a subject line that teases the announcement of the winner (which will also increase open rates). If yours is a user-generated content contest, you could also share the winning contest entries, along with other great “honorable mentions.” Featuring UGC in your email can foster a positive relationship with your new leads. Ready to convert your holiday contest entrants into paying customers? Offer discounts, free trials, or exclusive special offers to those who entered in your contest but aren’t paying customers yet. Offering a discount on your products or services is an effective way to nudge a lead toward an initial purchase. Everyone loves a deal, especially if it’s an exclusive deal! Since most businesses experience a slow-down in January, this is a terrific way to bolster your sales during a time of year when revenues often drop. Time this automatic email message to be delivered during your slow season, whenever that is. A discount or reward that’s “exclusive” to contest entrants or first-time purchasers. UGC images or reviews to highlight the value of your product, which increases the likelihood and value of conversions. A limited-time-offer, which increases a sense of urgency. If you’re wanting to warm up your prospects, think about information that would be the most useful as they start to learn more about your products and services. Most businesses have blogs and create content like ebooks and how-to guides as a way to prime the proverbial pump. Prospective customers give an email address in exchange for information they want to get their hands on. Describe the content briefly before sending leads to your site; you want them to get the full information at your homebase. Send content with value that’s obvious immediately, like how-to or educational blog posts. That’s only the beginning! Here are five more ideas for other autoresponders you can send throughout the year. Give your customers a tip related to your product that they can implement in five minutes or less. For example, if you own a housecleaning service, you might send your clients a tip on how to remove stubborn water stains from a shower door. 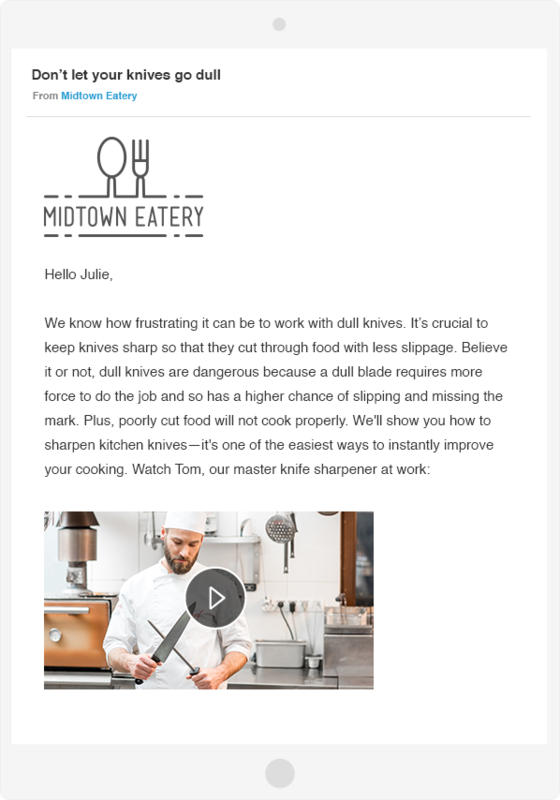 Or, if you run a restaurant, you might send your customers instructions on how to sharpen their knives at home. The idea is just to get in touch with helpful advice and keep your brand top of mind. Ask your subscribers a question that will help you create the kinds of products and services they want most. Think about this email as a crowdsourcing effort. Maybe you want to add a new color to your line of best-selling t-shirts or a new flavor to your existing menu of chocolate-covered fruit. You could send an email asking people what they’d most like to see from you. This is the easiest and least expensive kind of market research you can do! Send your subscribers a list of your favorite blogs, books, tools, etc. that are relevant to your business. For example, if you run an insurance agency, you could create an insurance “buying guide” that helps people determine how much and what kinds of insurance they need. If you don’t have the resources to create a guide on your own, look to industry leaders (that aren’t necessarily your competition) and share something they’ve created. In keeping with the insurance theme, you even find helpful resources your state offers. Here’s an example of what California offers. As soon as you’ve scheduled the date of your next contest or giveaway, send an email letting people know when it will run. This is the kind of email that should be very short and sweet. Your goal is simply to get people to open the email and mark their calendars, building anticipation for your next awesome contest. Ask your customers to share their opinion about your business. 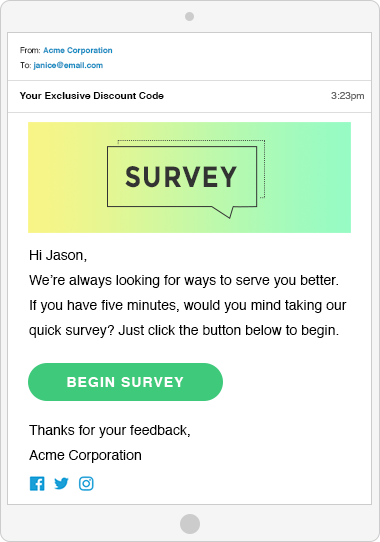 You can send a brief survey and then follow up with an automatic email offering a “Customer appreciation” discount. Now that you’ve gotten some ideas for how to use autoresponders, it’s time to write subject lines that’ll increase your open rates. Did you know 33 percent of people decide whether to open an email based on the subject line alone? Before hitting “send” on a marketing email, take a moment to craft subject lines that catch people’s attention. Anyone who receives your email should be able to read your subject line and believe that by opening it they’re going to get something out of it. Subject lines with multiple topics separated by pipes have the second highest open rate. For example: Thank you for entering |10% off Site-wide. Email autoresponders with subject lines that confirm entry to a contest or giveaway have a 46.9%** open rate. Subject lines with three words have a 25% higher open rate than seven-word subject lines. Since 40 percent of emails are opened on mobile devices, make sure people can read the entire line from their phone or tablet. Send at the right time. According to SendGrid, Tuesday at 4 p.m. is the best time to send email, but as soon as everyone gets wind of that, the best time will change so to figure out the best times for your lists, you have to test. Make the message feel exclusive. 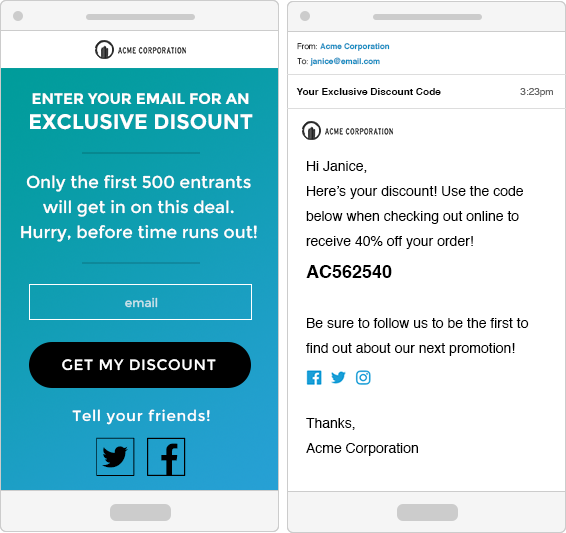 If you’re offering a discount on your product “10% off” in your subject line is more likely to increase open rates than “50% off” is (go figure!). Never use all caps (and try to avoid exclamation points!). 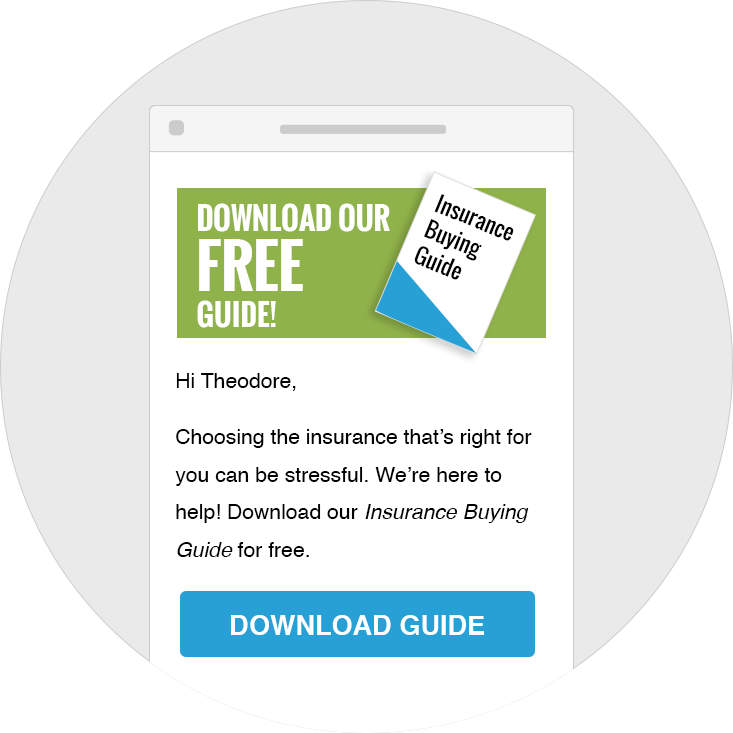 If you’re targeting by location, use location in the subject line. Avoid using links and hashtags in your subject lines; open rates with either of these drop to 10.5%. And we’ll conclude with a reminder: Never bait and switch. The content of your email should deliver what you promise in the subject line. If it doesn’t, get ready to see your unsubscribe rate skyrocket. Ready to put these tips to the test in your next contest or giveaway? ** Based on ShortStack’s original research.